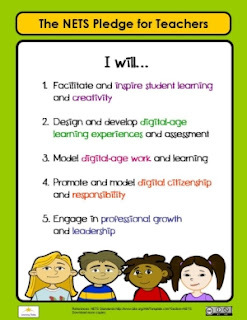 Learning Today created a pledge based on ISTE NETS standards for teachers. The editors converted the ideals behind the standards into the familiar format of an "I Will" chart. Teachers: Rate yourself using a scale of 1-3 on each of these points. In what area do you need improvement, additional support, or just ideas? At first glance, this is easy. This is what you have been working toward since the first day you lead a class. But think about how this relates to digital experiences. Consider the tools and resources that can both support and improve student engagement and learning. 2. Design and develop digital-age learning and experiences and assessment. Are your incorporating the digital tools and resources available to you and your students? This is not about technology for the sake of technology, this is about integrating the appropriate tools for specific learning goals. As student learning becomes more digital, it only makes sense that they are assessed accordingly. New Jersey state assessments will be going digital in the 2014-2015 school year, making this a higher priority. 3. Model digital-age work and learning. Our students are watching us. They see how we react to pop up messages and technology glitches, how we make use of other's people's digital content, and how we use the available tools to make the classroom experience work well. They already use these tools at home, students need to learn how to use them to benefit their learning. Again, our students are watching us. They see how we make use of other's people's digital content. They see which websites and web based content we think is appropriate and educational by what we share in the classroom and on our wiki/web pages. Talk about your choices, clue students in on why you selected a specific resource for use in the classroom. Take some time to explore a new tool or resource. Talk with colleagues, learn what tools they find beneficial for their students. Share your experiences with others. Explore beyond your school, browse some of the great educational technology blogs, such as Free Technology 4 Teachers, CoolCatTeacher, and The Innovative Educator.